3. Plug gaps and leaks in public subsidies and welfare programmes – A considerable sum of money that is meant for the poorest of poor does not actually reach them. While this money lenders through large system of government bureaucracy much of it is widely believed to leak and is unable to reach the intended parties. Government is therefore, pushing for direct cash transfers to beneficiaries through their bank accounts rather than subsidizing products and making cash payments. This laudable effort is expected to reduce government’s subsidy bill (as it shall save that part of the subsidy that is leaked) and provide relief only to the real beneficiaries. All these efforts require an efficient and affordable banking system that can reach out to all. Therefore, there has been a push for financial inclusion. Other transactions like mobile top ups, merchant payments, DTC recharge etc. 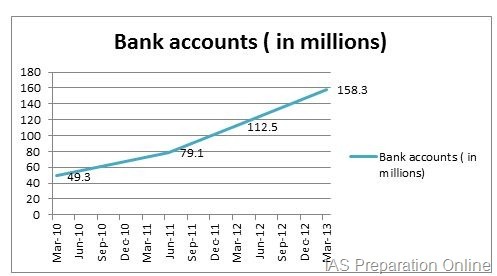 According to RBI reports, in January 2011, there were 724,682 m-banking transactions amounting to Rs.62.77 crore. In February 2011, it reduced to 707,496 transactions amounting to Rs. 61.61 crore, of which SBI alone accounted 74.81% transactions. The biggest challenge is the confidentiality, authenticity and integrity of the data. Thus, Information Security would have to be ensured for the success of this model. Thus, challenges pervasive at every level of the chain have led to the system getting evolved on the principle of compliance and not transaction, hitting it at the very foundation level. This is further aggravated by the low quality infrastructure provided by these BCs and the absence of financial literacy to the rural population. Thus, It has to be realized by the RBI and other bodies working for this cause that unless the issue is addressed at the grass root level, the performance of these initiatives cannot be optimized. So, the need of the hour is to ponder on these basic issues before building the edifice. It mobilizes savings that promote economic growth through productive investment. It promotes financial literacy of the rural population and hence guides them to avoid the expensive and unreliable financial services. This helps the weaker sections to channelize their incomes into buying productive resources or assets. In the situations of economic crisis, the rural economy can be a support system to stabilize the financial system. Hence, it helps in ensuring a sustainable financial system. This was a substitute to banks for having “Branchless access” to the rural customers. As a part of the BC model, the RBI recommended that banks should own the BCs as agents providing services like micro-credit, small value savings, micro-insurance etc. Also, the BCs were permitted to charge pre-defined service cess from the customers. These BCs or Bank-saathis were provided with electronic hand devices that identified the customers through the bio mark. This facilitated the deposit or withdrawal of money, without the need of a brick and mortar bank in the village. It was estimated that the number of potential customers at that time was estimated at around 480 million. It was targeted that by March 2012, the banking services would cover 72,800 villages, with around 2,000 villagers being provided by one or multiple financial products. The RBI survey showed that the BC model had helped to achieve results in 6 years that could not have been achieved in the past 50 years. The RBI results showed that the between 2010 and 2011, 73,000 villages had been covered and the number of bank accounts stood at 80 million, after a growth of 60%. But, was that an achievement? Not really. A study conducted by Microsave and Skoch revealed a startling result. Nearly 90% of these accounts had not been used by the villagers and hence were presently inactive. The Swabhinman project was launched in 2011, under which it was targeted to improve financial inclusion by opening 5 crore NPA (No-Frill Accounts) by 2012. This was primarily an extension of the BCs model by achieving “economies of scale”. It was also decided to popularize the concept, EBT (Electronic Benefit transfer) would be implemented. The union budget 2011-12 targeted to penetrate 20,000 villages during this FY. It has been integrated with the other welfare programs like NREGA, Direct Cash Transfer Scheme and Pension Scheme. By incorporating this, it has been extrapolated that there would be nearly 2 lakh beneficiaries enrolled by March, 2012. In 2011, Haryana was the pioneer in implementing this project, in the area of the pension scheme. But the project failed due to reports of absence of BCs, delays of payments etc. Consequentially, the Government reverted to the village Panchayats, for payments to the villagers. This acted as the deterrent for banks like SBI to extend the project further. The payment process gets more simplified and convenient. It reduces the cost of making the payments to the beneficiaries. The process gets more transparent by checking the occurrence of fraud in the money or duplicate and fictitious beneficiaries. It is because of this reason that Nandan Nilekani, head of the Unique Identification Authority (UIDAI) recently advised that the government make electronic payments for amount exceeding Rs. 1000.